Today I was looking at the recent trend in social media buzz about “social search”. I saw something that was interesting to my eye. The orange line is the portion of mentions of the phrase “social search” and Google. 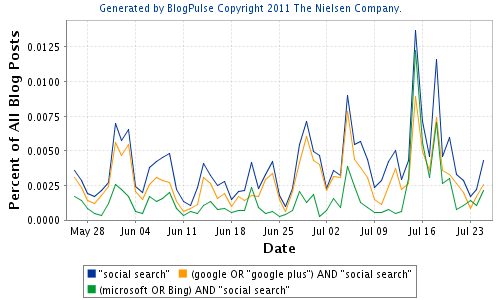 The green line is the portion of mentions of the phrase “social search” and either Microsoft or Bing. 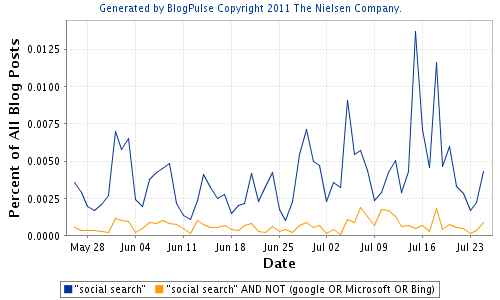 The buzz in blogs about “social search” overall tracks closely to work done by Google or Microsoft in that area. The spikes in buzz are usually related to some news or announcement from one of these companies. The spike in buzz on Jul 15th is related to an accidental reveal of an internal social search engine research project at Microsoft (first discovered by Fusible, and then picked up by Search Engine Land, and covered in many outlets including here at Bing Watch and Microsoft-Watch). There are a lot of startups and other entrepeneurs working on social search related technologies and services. Do these generate any buzz at all in social media? In this trend graph above, the blue line is the same as with the first trend graph on top, and the orange line is buzz about “social search” that does not mention Google, Microsoft or Bing. There’s a trickle of non-Google, non-Microsoft buzz regarding “social search”. But the overall public discourse on “social search”, the social search buzz dance if you will, is dominated by Google and Microsoft. I see this as further evidence that “social search” as we are currently viewing it in the market will be mainstream search engine features, as I wrote about it in this post on The Evolution of Social Search. In related news, my startup Zakta, officially announced the public availability of SearchTeam.com, the world’s first real-time collaborative search and curation engine. It is the first search engine on the Web to allows friends, classmates, family members, colleagues and other trusted people to search together and find and share what they need. For those of you who prefer to browse through a set of screenshots at your pace, rather than watch the videos, here’s a pdf file with annotated screenshots of SearchTeam.com. Early reviews have been quite positive, with promising applications of SearchTeam in School, at Home and at Work. I’d like to personally extend my gratitude to all of you who have tweeted, blogged or otherwise shared SearchTeam with your social circles. Innovation like SearchTeam can thrive only through the support of people like you. Thank you for your support!